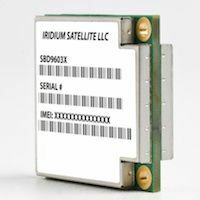 A revolution in scale, the compact Iridium 9603-N is the world’s smallest commercially available two-way satellite data transceiver, designed for applications where space is at a premium—and connectivity is critical. One-fourth the volume and half the footprint of the Iridium 9602, the innovative Iridium 9603-N transceiver combines the global coverage of the Iridium satellite constellation with the low latency of the Iridium Short Burst Data Service to provide highly reliable satellite communications from pole to pole. With the smallest form factor of any commercial satellite transceiver available today, the Iridium 9603-N is ideal for space-constrained applications including monitoring, tracking and alarm systems. It is also highly affordable, costing just slightly more than the previous-generation Iridium 9602. Delivering two-way communications on a remarkable scale, the Iridium 9603-N transceiver further expands the Iridium connected user base worldwide. A single-board, Iridium-built core transceiver, the Iridium Connected 9603-N transceiver comes in ‘black box’ format. All device interfaces are provided through a single multi-pin interface connector and antenna connector, with additional end-user field application functions (GPS, microprocessor-based logic control, digital and analog inputs and outputs, power supply and antenna) provided by the solution developer.